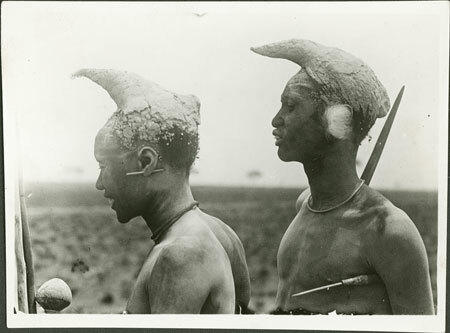 A head and shoulders profile portrait of two Nuer Lou men holding spear and club, with their hair plastered with light coloured clay into a single horn pointing forwards. The man to the left has a straight piece of wood or bone in a pierced ear, the man to the right a white feather. This image was given or lent to Evans-Pritchard possibly by C.G. Seigman and seems to have originated from Yuzbashi (i.e. Captain) Talib Ismail, a sub-mamur in the Upper Nile Province administration at Akobo from 1920-27. E. E. Evans-Pritchard Collection. Probably given to Evans-Pritchard by C. G. & B. Z. Seligman. Morton, Chris. "Nuer men with stylised hair" Southern Sudan Project (in development). 03 Jan. 2006. Pitt Rivers Museum. <http://southernsudan.prm.ox.ac.uk/details/1998.346.203/>.